4 What Is a Lift Kit and Why Do You Need to Install It? 5 What are The Different Types of Lift Kits? 6 What Are the Essential Factors to Consider When Choosing a Jeep Lift Kit? While Jeeps are already durable and are guaranteed to provide optimum performance on the road, most adventurers still like to outfit their Jeeps for it to be able to handle even the most intense off-road conditions. Even though the possibilities are quite endless, the most common aftermarket Jeep customizations that enthusiasts recommend are lift kits. In this post, we will be discussing everything that you need to know about choosing the best Jeep lift kit available on the market right now. We also have provided you a list of our top 6 picks, along with a detailed description of each product’s best features, pros, and cons. We do hope that after reading this post, you will be able to narrow down your choices into the choosing only the best. 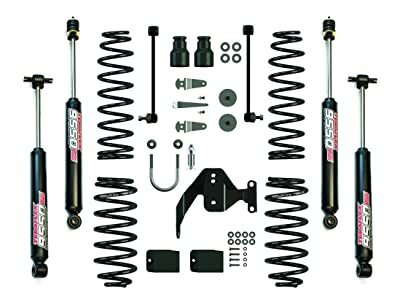 JKS is a well-known manufacturer of quality automotive components and parts and they also happen to offer one of the best lift kits on the market, the JKS 9904 body lift kit. With this model, it is guaranteed that your Jeep will have extra ground clearance. When compared to other body lift kits, the JKS 9904 delivers 1.25 inches of wheel clearance. You will also find it very convenient to install, as it will not require you any modifications to the fuel tank, exhaust, and radiator. With this, you can ensure that your Jeep will be safe even under harsh off-road conditions. In addition, it can maintain your Jeep’s stability, as well as provide you with stable driving. What’s great about the JKS 9904 lift kit is that it does not require you to alter your Jeep’s suspension system, which would mean that you can avoid any geometry change on its systems. For perfect fitting, it is recommended that you also have a TJ model, as no modification is necessary. TeraFlex is also a brand you can trust when it comes to Jeep lift kits. This product will be able to provide your Jeep with a robust suspension system, especially if own a Jeep Wrangler JK Unlimited model. You will find that the kit is very simple and it will not require you to spend a lot on such a high-quality lift kit for your Jeep. What’s great about the TeraFlex 1251002 is that the system already comes with shock absorbers, springs, and other necessary parts and components. It has also been proven to be useful, as it will allow your vehicle to run on 35-inch tires. To add, you only need to maintain at least 4.5 backspacing and it can still provide you the smoothest drive possible. When it comes to installation, it is very and would not consume much of your time. For accuracy, each component has been labeled correctly, allowing you to place the right component in the right position. It is also guaranteed that there will be no alterations, drilling or cutting. Overall, it will be able to offer you a durably constructed lift kit, ensuring your Jeep to regain its strength. The Readylift SST lift kit will be able to raise the front portion of your Jeep by up to 3 inches, and 2 inches in the rear. As advertised, the manufacturer has incorporated the spring spacer technology that allows you to retain your original OEM coil springs, instead of replacing your old ones. All these translate to maintaining a smooth ride, both on the street and off-road. As with other models on this review, the Readylift SST lift kit will not require you to do any modifications or cutting, as it offers direct bolt-in. in addition, it accentuates suspension travel, as well as articulation on off-road grounds. Lastly, the brand offers a limited lifetime warranty. 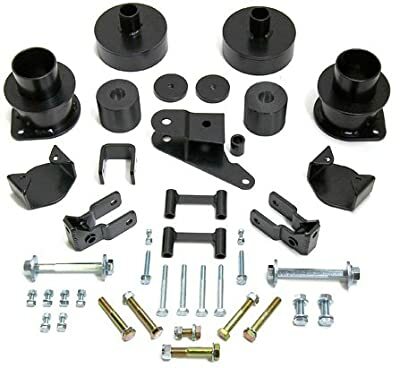 The Skyjacker is a lifting kit specifically designed for Jeep Wrangler models from 2003 to 2006. It is a great lift kit that provides full vehicle fitment without spending too much. It is also highly dependable with its professional and durable construction. What sets it apart from the rest is that it offers ease of fitting, as all components come with accurately labeled drilled holes and parts. It is also very easy to install and is tested to get rid of errors during installation. It is also durably painted, for it to be able to conform with the manufacturer’s original components. 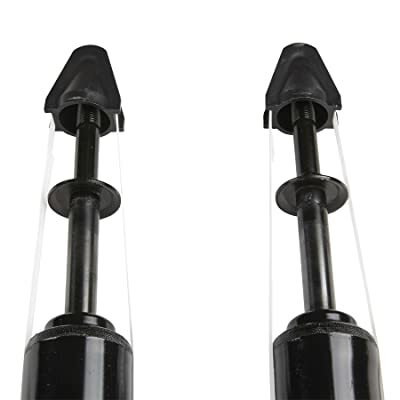 Lastly, the bushing on the shock absorbers maintains cleanliness, preventing dust and other kinds of dirt. The Rubicon Express lift kit would be able to further boost your Jeep in terms of handling power, ground clearance, and flexibility. This lift kit is designed to increase your Jeep’s height by up to 2 inches, allowing you to use larger tires while providing stability. 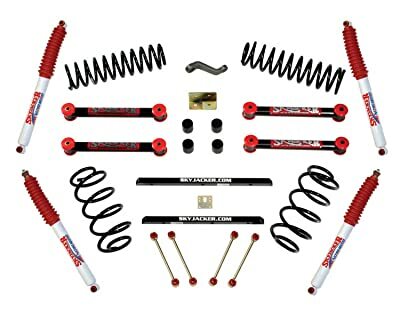 The kit already comes with spring spacers, coil springs, and shock absorbers. A complete kit like this would guarantee a more stable Jeep, whether you drive it on a highway or off-road. In addition, the installation has been proven to be very simple. You just need to fix the spring spacers and the twin tube shock and it will be ready for cruising. To add, the suspension will also allow you to use 31-inch tires. What Is a Lift Kit and Why Do You Need to Install It? Before we proceed with the discussions, we should first talk about what it is and its importance. 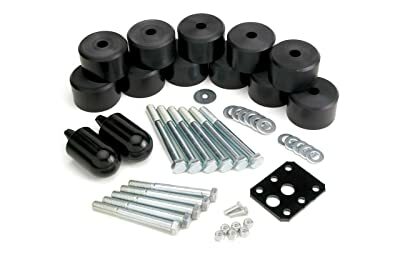 A variety of lift kits are used to enhance a Jeep’s appearance, provide additional space for bigger and more rugged tires and increase its height. Probably the best takeaway from having a lift kit is that it improves your Jeep’s overall off-roading performance. Basically, a lift kit raises the suspension or body of your Jeep. It can either be a body lift, which increases the distance between the body and the frame or a suspension lift, which increases the distance between the frame and the axles. However, it should be noted that while it might be great for off-road conditions, it might not be able to provide stability for daily driving. There are also various reasons why you should install a lift kit for your Jeep. First off, it increases ground clearance. This might be the most important one because it prevents damages from flood, as well as those that can come from debris, especially when you are driving on rough roads. Therefore, raising your Jeep even just a few inches from the ground is a significant exercise. Second, it allows you to utilize larger wheels. In case you didn’t know, off-road wheels are a lot bigger than the highway counterparts, which is why it might be challenging for you to use off-road tires when using only standard suspension. With this, most Jeep enthusiasts opt to install a lift kit for them to be able to use bigger tires. Lastly, it uplifts your vehicle’s profile. You may notice that this is a common practice among truck owners. They want their Jeeps to look bigger and taller than others. To add, it enhances the overall visual aesthetic of your Jeep, making it look more rugged and more suitable for riding on rough roads. What are The Different Types of Lift Kits? Considered the cheapest lift kits on the market now, body lift kits are specifically designed for lifting the vehicle’s height. More and more Jeep owners are now using this type of lift kit because of its uncomplicated construction. While it uses blocks and spacers to raise the frame, the body would remain in its original height. One great advantage of using the body lift kit is that it allows you to use bigger tires, which might be the only thing you can do with this type of lift kit. Since there would not be any modification in the suspension system, it technically does not make your truck off-road. Therefore, if you drive your Jeep off-road, it can still be damaged by debris and big rocks. More advanced than the body lift kits, leveling kits are sold in large configurations. It may be constructed from steel, which makes strong enough to be on the same height as the back. It may also be made of Polyurethane coil spring spacers and aluminum. It may come with U-bolts, designed for vehicles with leaf springs. With this type of lift kit, you can install larger tires and fully suspend your vehicle’s frame. Most importantly, it increases your Jeep’s ground clearance, which certainly improves its off-road capabilities. However, you should be informed that installing a suspension lift kit would require you to also change your Jeep’s leaf springs and shocks. What Are the Essential Factors to Consider When Choosing a Jeep Lift Kit? Before you even choose what lift kit you want to install on your Jeep, you must first consider your budget. The reason is that for high-performance lift kits, it might require you to dig deep into your pocket. While some are very cheap, others, however, want to invest in premium kits. After you have decided on your budget, now is the time to choose the lift kit of your choice. There are some that come with an instruction manual and can install at home while others are more complex and might need an experienced mechanic to install. When choosing a lift kit for your Jeep, you might want to consider one that is easy to install, so you can avoid any extra labor cost. When choosing a Jeep lift kit, you should also consider the height you are aiming for. Doing so to too much might affect the stability of your vehicle, especially when you are driving on off-roads. There are a lot of options to choose from and it might be difficult for you to decide if you are not sure about the result you are buying the lift kit for. Choosing the best Jeep lift kit would be very challenging if you don’t know where to start looking. With this guide, we hope we are of great help especially with the reviews we have presented. While we have provided you with all that you need to learn before you buy a lift kit, it is entirely up to you to choose which one offers the most value for your money.